In this issue, we focus on commercial operators of EO satellites and the dramatic increase in the amount of data collected on a daily basis. 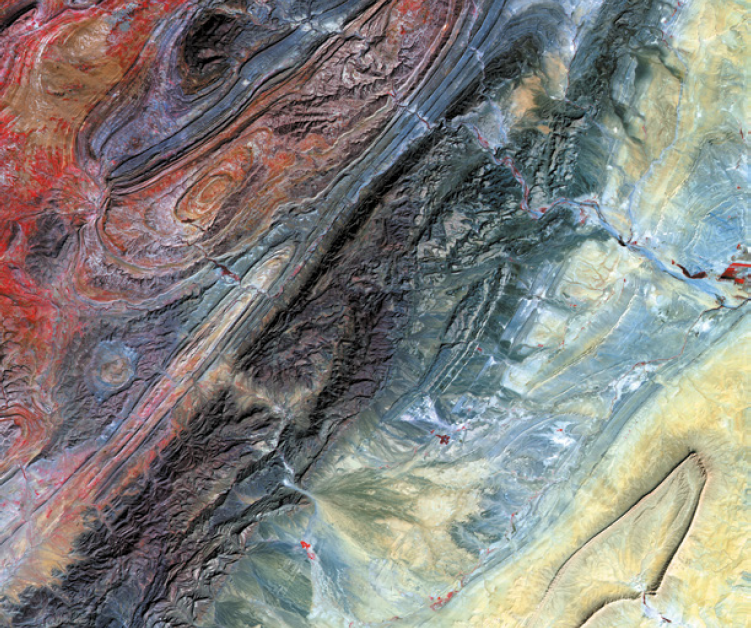 DigitalGlobe (Maxar Technologies) and Airbus are the longstanding incumbents supplying up to 0.3m spatial resolution images with a wide selection of spectral bands. However, significant market disruption has occurred over the last nine years with new players entering the business. Although the first wave of startups was from the United States, we now see this as a global phenomenon. Our objective here is to review the variables underpinning this change. We will identify many of the drivers for this innovation and what the global development community, as consumers, might expect over the coming years. In 1972, the Earth Resources Technology Satellite (now known as Landsat 1) launched to become the first non-military EO satellite on orbit. From the mid-1980’s, commercial entities were interested in launching satellites. However, the road to financing and operations was expensive and fraught with launch and on-orbit failures; In short, sending a satellite to orbit was an expensive, painful and lengthy process as Elon Musk says — “space is hard.” Eventually, SPOT-1, the first commercially purposed satellite dedicated to EO, launched in February 1986. SPOT-1’s success was achieved under the auspices of the governments of France, Belgium, and Sweden, making it quasi-private. 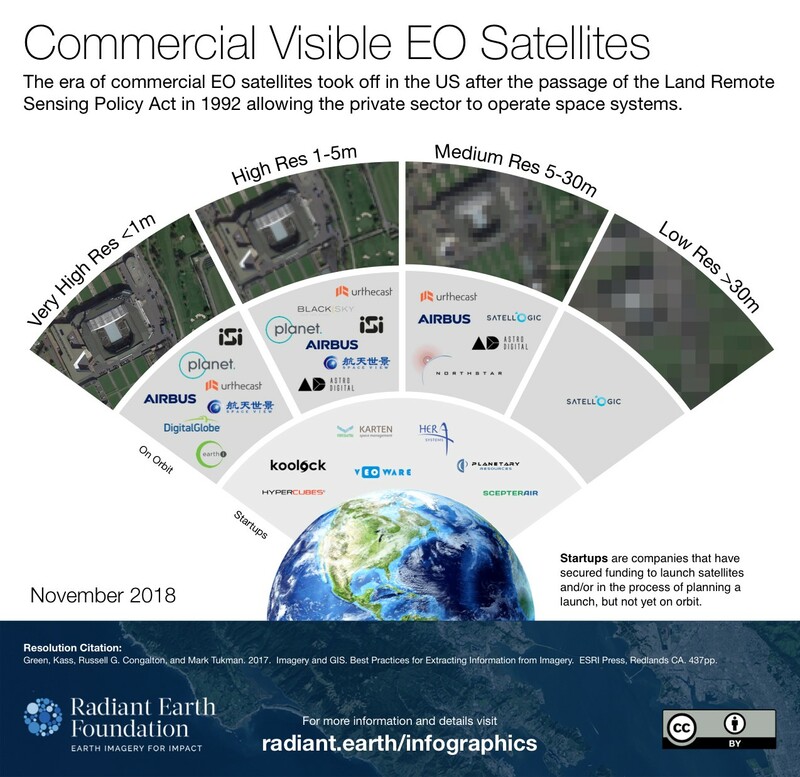 While SPOT-1 opened the doors for commercial companies to explore space opportunities, the era of commercial EO satellites took off after the US Congress passed the Land Remote Sensing Policy Act in 1992, allowing the private sector to operate space systems (Gabrynowicz, 1993 and Fritz, 1996). Finally, in September 1999, we saw the successful launch of IKONOS-2, which was shortly renamed to IKONOS (as IKONOS-1 experienced a launch failure). The IKONOS satellite was the world’s first commercial 1m Earth observation satellite, designed and implemented entirely with private funding. QuickBird soon followed IKONOS and was another significant milestone for the Earth observation market, acquiring pixels at 0.65m spatial resolution. Together, both IKONOS and QuickBird satellites offered, for the first time commercial, high quality, very high-resolution optical imagery. In 2014, another significant market barrier was removed when the US government relaxed DigitalGlobe’s commercial license restrictions and authorized 0.3m resolution imagery to be sold commercially. DigitalGlobe launched WorldView-3 in August of 2014, which captures a 0.3m resolution imagery. Fast forward to today and on-orbit satellites from these original market leaders include DigitalGlobe’s WorldView 1, 2, 3 & 4, as well as Airbus’s Pleiades 1A & 1B satellites along with SPOT 6 & 7. Timeline of Commercial Space Satellite Launches and Significant Policy Changes. The first discriminator of the commercial sector is the ability to supply very high-resolution optical imagery to users. However, what enables the success of any product, is its acceptance and growth in the marketplace. DigitalGlobe and Airbus collectively drove the development of commercially viable products in a nascent market, enabling technological advancements to where we see the expansion in applications today. Perhaps, what DigitalGlobe and Airbus did not anticipate was the business impact of a radically changing paradigm in satellite design, production, and operation. In early 2009, the market disruption kicked into high gear after a committed group of young NASA scientists left their government and University jobs and founded SkyBox Imaging; a startup satellite company based in Silicon Valley. Planet Labs soon followed SkyBox, and a new space race began. Their collective approach to building and launching satellites was dramatically different than the two traditional market leaders of the time, marking a radical shift that is now known as NewSpace. First, they used commercial off the shelf parts wherever possible. The availability of this technology was made possible by the rise of the smartphone and its component technologies. Second, they designed and built dramatically smaller satellites at a fraction of the cost. Third, they envisioned their system from the beginning, not as just one satellite, but engineered as a constellation, which allows one to image at a much higher temporal resolution, opening new markets. Fourth, they built them fast and iterated on both the hardware and onboard software design using agile engineering methods. Alongside these innovations in the satellite market, an even-more-radical disruption is occurring in the rocket manufacturing industry. The estimated price to launch an average CubeSat is $240,000; all this for an object the size of a shoe box. 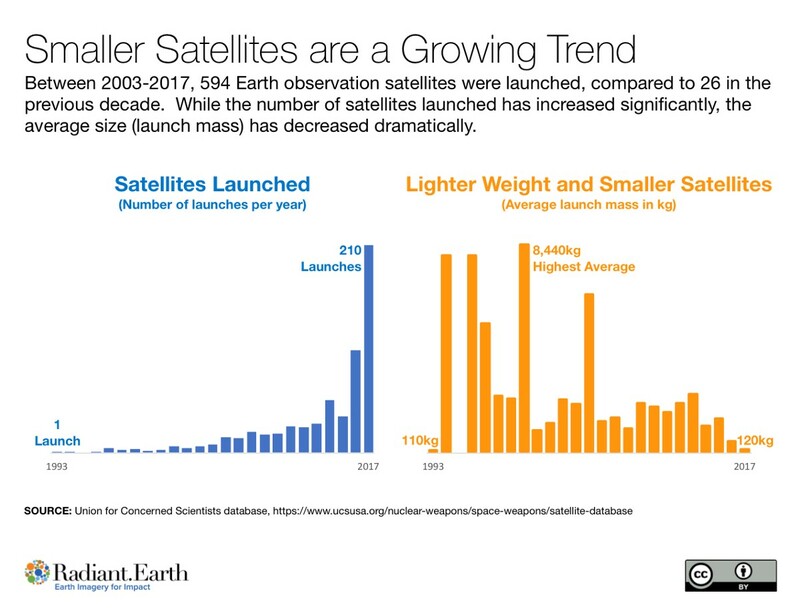 In spite of the decreasing cost, sending satellites to space remain expensive, and the availability of launch capacity is a major barrier to all satellite operators, large or small. This radically different manufacturing approach attracted some of the most prestigious venture capitalists in Silicon Valley. To participate successfully, new entrants not only needed to take market share from the established players, but they also had to create new markets to drive revenue growth. If there is one company that epitomizes this new age of commercial Earth observation, it is Planet. Formed at the end of December 2010 in Silicon Valley, by late 2017, they had announced that mission 1 (to image the Earth daily) was complete. Planets’ approach to designing a large constellation had paid off and enabled this remarkable feat. As of June 2018, Planet had 190 satellites (Dove’s) on orbit. The CubeSat revolution, namely building small satellites with commercial off the shelf parts and iterative design sprints, have reduced the cost to operate in space. The militaries of the world have always been the anchor tenant for commercial imaging companies. Without these large contracts underpinning the private space sector, the early entrants would never have gotten financing, let alone stayed in business over the past seventeen years. It should subsequently come as no surprise that government organizations are helping to support and grow the CubeSat market as well; President Obama’s Administration announced the “Harnessing the Small Satellite Revolution” initiative, which supplied NASA with up to “$30 million to support data buys for smallsats.” Additionally, both the US National Geospatial Intelligence Agency (NGA) and National Oceanic and Atmospheric Administration (NOAA) awarded contracts to commercial companies working with CubeSats. The Trump Administration too seems supportive of space entrepreneurs. Traditionally, Airbus and DigitalGlobe sold square kilometers of pixels or full scenes through a variety of different pricing options. New entrants, however, pushed the market boundaries to subscription-based services for on-demand image viewing and analysis, forcing the competition to follow suit. In this environment, a race to build the “Platform” — where consumers would sign on to identify the data they need, along with executing the analytics necessary to supply the answers they seek, all in a cloud-based environment — is in full swing today. An interesting wrinkle in this business model is the emergence of commercial companies applying machine learning (ML) techniques to satellite imagery, but that do not own the satellites themselves. Companies like Orbital Insights and Descartes Labs offer services directly to other businesses, and, increasingly to governments and non-profits. These companies require contracts with the commercial satellite operators to get access to the imagery. The satellite operators have now also invested heavily in ML data analysis and are moving aggressively into the ML services business, approaching many of the same customers. This market space is likely going to evolve quickly. In the space of a decade, the growth of the commercial EO market has revolutionized the way we use Earth observation data. We are no longer reliant on one or two image providers, nor are we restricted to limited temporal coverage. The market has more choices now than ever before: ICEYE, GaoJing, ImageSat International, Deimos Imaging Inc, and BlackSky Global are just a sample of the NewSpace players that join the companies previously mentioned who supply EO data. Industry research suggests that the EO commercial data market totaled over $1 billion in 2017 alone, with the value-added services market reaching over $3 billion (NOAA ACCRESS, 2018). The barriers to entry have never been lower, and this can only benefit users working in global development. It is a difficult task to track the new companies emerging in the commercial EO operators market, but one that is well worth watching and supporting. What Consumers Should Expect in the Coming Years. We noted in our first article how 2017 was a world record year for the number of satellites launched. With private investment and venture capital increasing, utilizing data from space is becoming more commonplace across many industries. At a minimum your chance of finding cloud-free imagery is increasing. Increased competition should lead to lower pricing if the consumer competitively procures of the data. Government customers following procurement regulations run extensive and highly competitive procurement competitions. Large commercial consumers of EO data and services aggressively negotiate pricing terms with the Satellite operators. But outside of governments and large commercial buyers it has been a norm for buyers to purchase imagery without requiring market competition or bids. This practice has allowed for pricing to remain very opaque and has slowed the development of a more efficient and competitive marketplace. In addition to more competitive pricing, it is also possible to see competition occurring as it relates to licensing terms for the use of the imagery. Negotiating licensing terms is a feature of EO procurement that is ripe for increased scrutiny and consultation on the part of the buyer. Finally, not all of these startups will succeed. While some will fail to make it to orbit, others will fail to establish revenue streams sufficient to operate the business and provide a return to their investors. This setting suggests a marketplace that is ripe for another round of acquisitions leading to market consolidation. In a nutshell, it means that things are changing very fast. And that is all good! In the next issue of this series on the value of EO data and tools, we will explore the growth of service companies that apply machine learning and other new technologies to automate remote sensing analysis. Click here for more information on commercial space innovation. Gabrynowicz, Joanne. November 1993. The Promise and Problems of the Land Remote Sensing Policy Act of 1992. Space Policy, Vol. 9 (4), pp. 319–328. Green, Kass, Russell G. Congalton, and Mark Tukman. 2017. Imagery and GIS. Best Practices for Extracting Information from Imagery. ESRI Press, Redlands CA. 437pp. NOAA ACCRESS (Advisory Committee on Commercial Remote Sensing) Report. October 2018. Earth Observation: State of Play and Future Prospects Presentation. United Nations, Satellite Imagery and Geo-spatial Data Task Team. 2017. Earth Observation for Official Statistics: Satellite Imagery and Geospatial Data Task Team Report. United Nations, New York, 170pp.